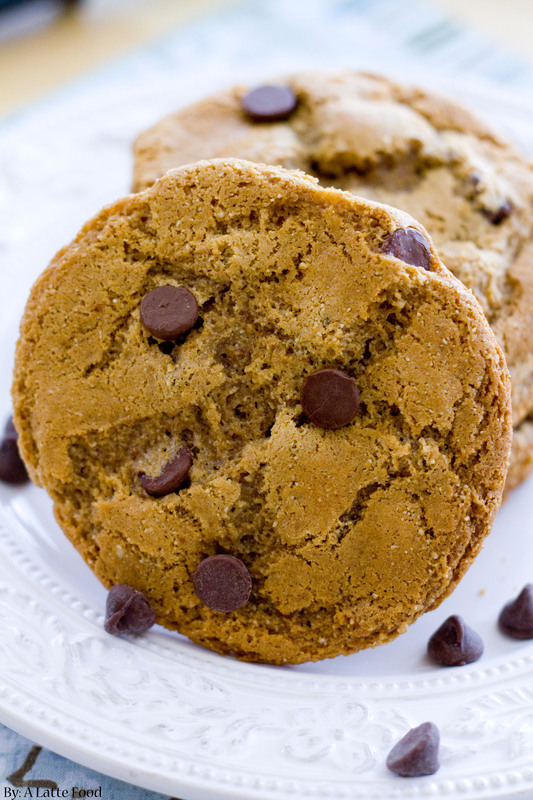 Gluten-Free Peanut Butter Chocolate Chip Cookies: With no butter or flour, these peanut butter chocolate chip cookies are chewy, perfectly chocolatey, and on the healthier side! About 180 calories per cookie. Happy Monday, all! Hope the start of the work week is glorious. I’ve been packing, unpacking, and repacking for my NYC trip. Since airlines have begun charging for checked-on bags, we’re trying to cram everything into carry-on cases. I’ve been doing research like crazy to see how to pack a carry-on, and let me tell you, it’s easier than it looks, especially when the weather in New York is supposed to range from hot and sunny to humid and thunderstorming. My original plan of just packing sandals has been thwarted. Cookies are always a good remedy for packing crises. Speaking of cookies, you all rock, because A Latte Food hit a major milestone because of my Healthy Banana Chocolate Chip Cookies. They’re vegan and gluten-free (the irony that one of my healthy recipes has gained some of the most attention when I’m a sugar-a-holic is not lost on me), easy to make, and incredibly delicious. Even my vegan and gluten-free brother and sister-in-law would love these. Anyway, since the success of those cookies, I thought I’d give gluten-free peanut butter cookies a try. And you know what? They’re awesome. Honestly, you don’t even notice the flour is gone. And, without the flour, the cookies taste like peanut butter Reeses cup in cookie form. These cookies start with peanut butter. Homemade peanut butter to be exact. Recently, I tried my hand at homemade peanut butter and loved it! Of course, you can use regular peanut butter, but if you’ve an extra 5 minutes, I’d suggest trying homemade peanut butter. It’s super simple and so so good. Next, I used all brown sugar because I love the molasses flavor of brown sugar, plus it gives the cookies that chewy texture. Add in an egg, baking soda, chocolate chips, salt, vanilla, and espresso powder (seriously adds so much depth to the cookie flavor). Bake at 350 for 8-10 minutes, and that’s all there is to it! With no butter or flour, these peanut butter chocolate chip cookies are chewy, perfectly chocolatey, and on the healthier side! About 180 calories per cookie. In a bowl, beat peanut butter and brown sugar together. Add in egg and vanilla extract. Beat until mixed. Add in baking soda, salt, and espresso powder. Mix. Add in chocolate chips. Mix. Makes about 24 medium cookies or 12 large cookies. Bake for 8-10 minutes.